You may remember that at the end of July, the financial press reported on one of the biggest acquisitions of the British high-tech firm ARM by Japan's Softbank. Softbank paid US$32 billion (S$44 billion), 43 per cent above the last share price of ARM, for a firm with fewer than 4,000 employees, sales last year of about US$1.5 billion, and profits before taxes of about US$500 million. That looked like a very high price for a relatively small company, even if its profitability is impressive. Who is ARM and are there any lessons for Singapore-based innovators? Both of us have been following ARM over many years and wrote case studies for our classes about it. You may or may not be familiar with ARM, but almost all of us are indirectly their customers. ARM is a pure intellectual property (IP) company. They design, but don't produce, a specific type of microprocessors which use fewer instructions and thus less energy. The processors based on their IP are used in 95 per cent of mobile phones as well as other mobile devices and more recently in intelligent devices that can talk to each other over the Internet. This is generally called the Internet of Things. Most of your smartphones or tablets, your smartwatch that keeps track of your sleep or the number of steps you walk, or the GPS in your car may be using ARM's processors. They are obviously active in a fast-growing market. We hear the buzz about smart cities, the Internet of Things, wearable technology, driverless cars - and all of these require processors of the type ARM helps to design. But paying US$32 billion for a company with fewer than 4,000 employees (or US$8 million per employee) and that has no manufacturing, and produces only IP, isn't that a bit over the top? We are convinced that the price wasn't paid just for the visible assets, but also for their unique innovation system. We have described this as an ecosystem for innovation. The idea is actually not so new: ARM has developed an extensive network of partners that co-innovate and co-develop with them. 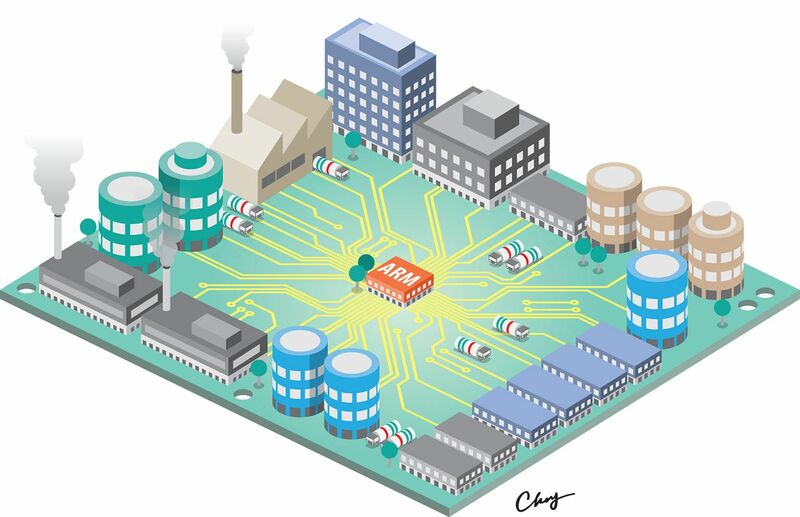 Some of these design processor chips based on ARM's IP, others have chip fabs or fabrication plants that produce the chips. Smartphone producers use the chip to program their devices. ARM is a master at orchestrating this network, without controlling all the participants in the network, and is at the centre of know-how exchange between the many partners. Such ecosystems where peers work together to create value for the end user are perhaps not new. They existed back in mediaeval times when independent textile workers would work together, or in the management of water on rice terraces in Java. But ARM has been very clever in using such an ecosystem to innovate in the high-tech sector. When Softbank bought ARM, it actually bought into a vast network of firms collaborating to innovate. Are there valuable observations one can make about this case for Singapore-based innovators? We strongly believe so. Cambridge is, of course, within the United Kingdom, but there are almost no customers for ARM's IP in the UK. In that sense, it is a similar situation to that of many Singapore-based innovators with our very limited home market. The first observation is that there is a lot of money to be made in the production of intellectual property. ARM's revenues come basically from royalties. And most of its employees are sophisticated knowledge workers, whether they are designers or commercial account managers. Those are the type of well-paid jobs we want here in Singapore. Those are the jobs that are far less sensitive to international comparisons of labour cost. The second observation is that innovators should not try to do everything themselves. ARM is good at mobilising and guiding a very international network of knowledge partners. Some of them are huge players like Huawei, Samsung or Apple. And yet a small company like ARM is able to act as a lead firm in such a network, by cleverly orchestrating the network. ARM achieved this in an industry where the paradigm was one of vertically integrated companies. Creating such an integrated value chain from scratch would have required huge investments, while ARM with its clever management of the network could start up with limited capital. It is successful because it is also willing to share a lot of the value created with its partners. That also helps them to scale up fast. A small company usually does not have the resources to finance a worldwide distribution machine. ARM did scale up very fast by relying on its partners. Therefore, our advice to many innovators would be to specialise, be very good at understanding what your IP is all about, and learn how to manage ecosystem networks to your advantage to scale up and innovate. In fact, that is what Singapore as a nation is doing: using its soft power to play above its weight. It is in our DNA to catalyse and orchestrate the networks. Let's use it to manage innovation. A third observation is that ARM chose to be a global company from Day 1. It has only a few customers in continental Europe. Last year, only 10 per cent of its revenues came from Europe (including the UK), while North America and Asia accounted for 38 per cent and 52 per cent respectively. From the start, its customers were distant companies such as Sony, Samsung or Texas Instruments, in every corner of the world. Yet the UK remains its headquarters and a lot of its design still happens there. Even as a start-up, ARM had sought from the beginning to operate in Seoul, Tokyo and the US. Going global was not easy and originally it had to be done on a shoestring budget. But it had a huge and global ambition. This was summed up in our case study: "When the 12 founding engineers of... ARM Holdings met in a 14th century barn near Cambridge in 1991 to welcome their new CEO Robin Saxby, he asked them a brutal question: Should we strike out for something, or just be in the hand-to-mouth chip design consulting business? The team decided to aim to become the global standard for RISC chips with a target of embedding ARM designs into 100 million chips by the year 2000." We often use this quote to show the ambition that a small company in Cambridge had. In Singapore, we need similar ambitions to set international standards and to strive for sales volume. There is a fourth observation. ARM is relying on highly specialised developers from all over Europe and the world. It faces shortages of well-trained engineers in the UK and is therefore relying on a multinational group of talent. Many commentators warned that with Brexit and the possible ensuing restrictions on migration, the foreign talent pool could dry up and force ARM to reduce its activities in the UK. These highly innovative high-tech companies often rely on a constant stream of very specialised foreign talent. The economic multiplier effect of such talent can be very high. Let's keep an open mind about migration both in the UK and here in Singapore and let's invest in managing such highly diverse workforces. If innovators in Singapore learn from these observations, perhaps we will be able to write a similar story about the takeover of a Singapore high-tech company in a few years from now. Arnoud De Meyer is president of the Singapore Management University and Peter Williamson is honorary professor of international management at the University of Cambridge.